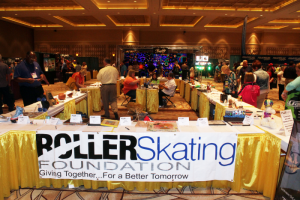 Each year, the Roller Skating Foundation hosts a silent auction at the RSA Trade Show to raise funds to support the mission of the Roller Skating Foundation. We encourage you to donate a product or service to the Roller Skating Foundation’s Silent Auction by using the form below. Please include all details and make copies of this form, if necessary. This year’s event will be held during the 80th Annual Roller Skating Association Trade Show. In return, you will receive extra publicity in publications and throughout the convention and trade show. The Roller Skating Foundation is a 501(c)3 non-profit organization founded in 1996 to benefit the roller skating industry. All donations are tax-deductible.﻿ Fill out the form below and click submit! Please note that the deadline for submissions is April 15. Please indicate how your donation will be provided to the Roller Skating Foundation. (Check one below). I will bring the item to the convention. I will mail the item to the RSA office by April 15. To promote physical fitness and to help build self-esteem among school age children and discourage unsafe and undesirable activities by providing them with a constructive alternative to becoming involved in drugs and crime. To establish and provide scholarships to eligible high school seniors in furtherance of their undergraduate education and to offer grants to educators and volunteers. To promote family values by providing families with opportunities to participate together in the sport of roller skating. To promote safety and risk management programs. To receive, administer, distribute and expend funds, gifts, donations, bequests, contributions and other receipts of money or property of every kind of nature in furtherance of the Roller Skating Foundation’s charitable and educational objectives and purposes.